On Saturday, March 4th, the Middle Georgia Down Syndrome Society will host their 2017 Buddy Walk® at Lane Southern Orchards in Fort Valley, GA. The event serves as the annual fundraising campaign for the organization. 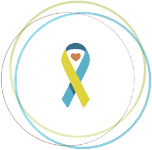 Through donations and sponsorships from individuals and local businesses, the organization is able to provide support to the middle Georgia area and affiliated support groups: the Middle Georgia Down Syndrome Society Support Group and the Down Syndrome Support Group of Houston County. They are also able to lend assistance to local organizations which provide services and activities for their members, including the Miracle League of Macon, the ARC Middle Georgia, Wesley Glen Ministries, and the Best Buddies program in their local schools. The Middle Georgia Buddy Walk® is an opportunity for families and individuals to create and maintain relationships. Through this event, the organization is able to raise awareness, promote inclusion, and advocate for families and individuals in the Down syndrome community. I had the pleasure of speaking with Sarah Pond, team captain of Caroline’s Court, a first year team and one of Middle Georgia’s top fundraisers this year, about her experience with the Middle Georgia Buddy Walk®. 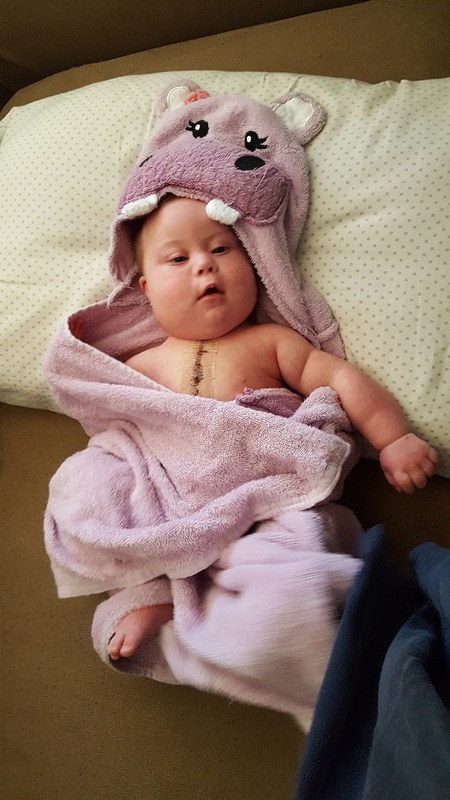 Sarah’s team is supporting her six month old daughter, Caroline, who recently underwent a very successful VSD surgery. 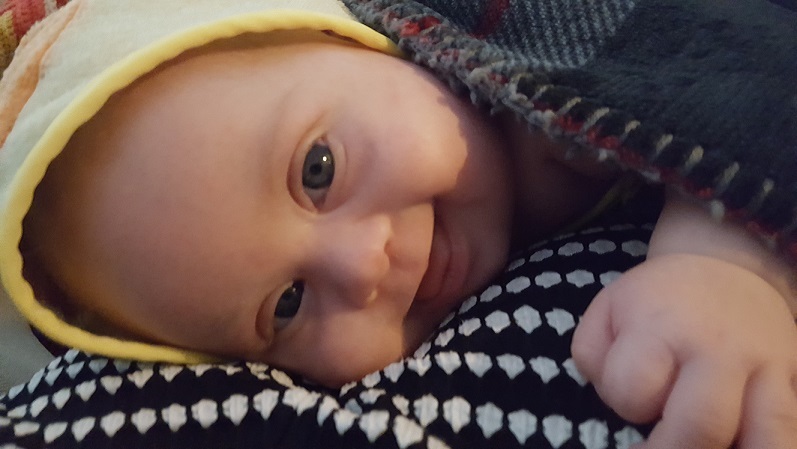 Sarah shared that Caroline is a very happy, smiley baby who rarely fusses. Sarah learned of the Middle Georgia Buddy Walk at the therapy center where she takes Caroline; they hold informational sessions for families. At the October session, they presented information about the walk. Because Caroline was so young, Sarah didn’t know many families in the community yet so the information she received at the session was really valuable. She decided to start a team, which Caroline’s grandmother named “Caroline’s Court”, because it fit well with the baby’s nickname, “Princess Caroline” (which she’s been called since before her birth!). Sarah has been busy spreading the word about Caroline’s team; she uses her Facebook page to post updates and invite family and church family to the event. Sarah has also been updating her team’s profile page to keep everyone informed about Caroline’s progress, especially since she just had heart surgery. Princess Caroline has a very supportive family, which is evident in her team’s progress: they have already exceeded their fundraising goal for this year! Sarah said that next year, they will try to beat the amount they raise for this year’s event. Because this is their first experience with a Buddy Walk®, Sarah plans to just “go with the flow”. She has asked that the team members dress up in different prince and princess costumes, but she mostly looks forward to her family and friends seeing a “normal, fun event” where kids with Down syndrome are interacting with their loved ones. She wants them to see that Down syndrome is “not a big deal; everyone can play and have fun together.” Sarah is looking forward to a fun day, enjoying time with her family and friends. Once Caroline is a bit older, Sarah looks forward to becoming more involved with the Middle Georgia Down Syndrome Society, as they provide a lot of great programming. She looks forward to participating in those events with Caroline, and knows that the funds she is raising will help build those programs. To learn more about the 2017 Middle Georgia Buddy Walk, please visit their fundraising site and their Facebook page.